A stranger – unknown, but not unfamiliar – told you what to take to work today. She also told you how to dress the kids, what to avoid this weekend, where to park the car, and whether or not you should water the garden. And you appreciated the information; after all, what would you do without your weather forecast? 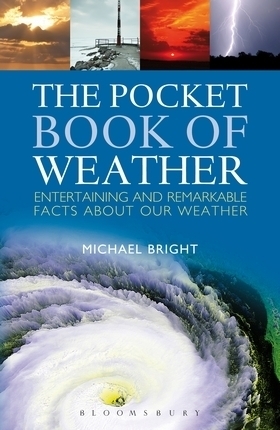 In fact, you wanted more – and when you’ve got “The Pocket Book of Weather” by Michael Bright around, you’ll get it. For as long as there have been people, there have undoubtedly been people who’ve looked skyward and wondered if they’ll get wet, sweat, or need more sunscreen. Just as it is now, their day-to-day existence was affected by weather – and because of that, early humans began to recognize trends in the atmosphere. Of course, some of them were Old Wives and they had tales to tell but, even as far back as 400 BCE, meteorologists (a word coined by Aristotle) had real ways to measure what was going on outside. By the 1700s, meteorology was a “new science;” in the mid-1800s, information was shared internationally; and by 1900, the world had climatologists who understood winds and storm-making. Today’s meteorologists have a lot of information with which to prognosticate: they can tell which clouds will soak you and which will dissipate. They can track the path of a tornado or hurricane (something birds seem adept at doing naturally). And they can offer a hint of what your weekend will be like, although Bright says that the farther out the forecast gets, the less correct it is. In this book, you’ll learn what oktas are, and how to measure them. You’ll see that “high pressure” isn’t what you put on your weatherman when you want sunshine. You’ll find out why you should run from a pogonip, the difference between a cyclone and a tornado, why you should take flash flood warnings very seriously, how hail can kill you, what snizzle is, how bugs can tell the temperature, and why you should definitely avoid being outside at 7:30pm in July during a thunderstorm in central Florida. If you’re like just about everybody I know, the weather has been a big concern of yours in the past year or so. You look to the sky, you check the batteries in your weather radio, and you read or watch the forecasts. Once you’ve got “The Pocket Book of Weather,” you’ll be able to understand what they mean. But deciphering weather reports isn’t all that author Michael Bright offers his readers. We also get anecdotes about unusual weather phenomena, history of instruments and ideas, explanations of how weather is made, and how animals adapt to it. In addition, Bright goes on to look at climate change and the future of our planet. I like this book because it’s wide in scope but not too much so. It’s easy to understand, it’s enjoyable to read, and with real information and facts you can believe, “The Pocket Book of Weather” isn’t just full of hot air.